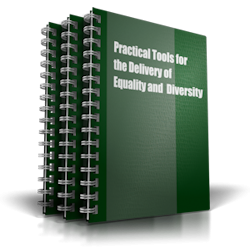 Practical Tools is a set of three equality and diversity activity resources. These packs contain 60 practical tried and tested activities that can be easily adapted as required for different audiences and come complete with differentiation ideas and materials to meet individual needs. All offer the participants powerful insights into the key equality and diversity issues covering all of the Protected Characteristics.